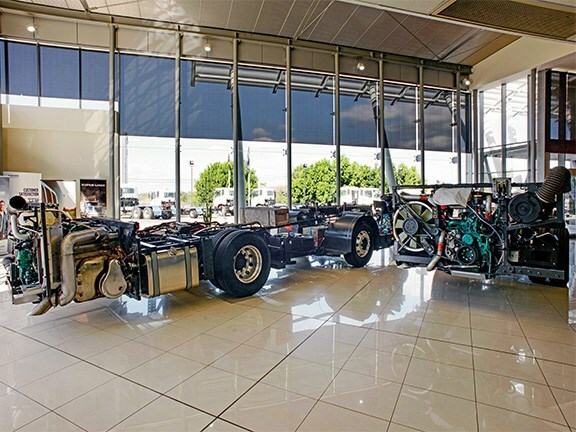 Volvo Australia’s nationwide launch of its new chassis spanned Brisbane, Newcastle and Sydney, with Melbourne also on the radar. and B7RLE, which saw sales exceed 40,000 units in 65 countries worldwide. 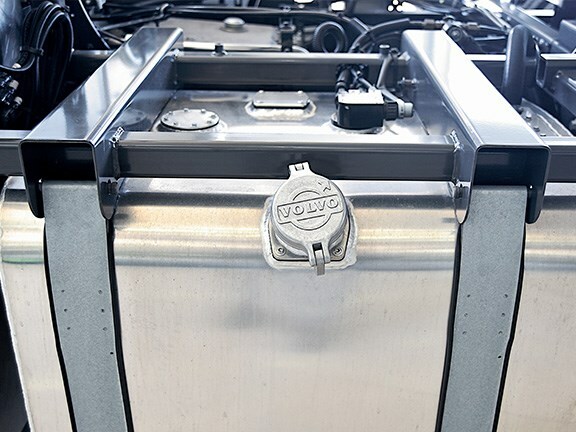 The new Volvo chassis has the benefits of a higher power output while maintaining the same or lower fuel consumption levels than its predecessor, with the added benefits of increased safety levels and significant savings on maintenance that are extremely important for today’s operators. Volvo Bus Australia general manager Sean Copeland says the company decided to stop producing the B7 this year – last orders will be taken in June – with Volvo opting for a "family engine basis" in its new range. "The 8-litre is a common engine basis across our truck range, and this will help with consistency across our range from an aftermarket perspective in relation to parts," Copeland says. "The B7 also had a Deutz block, but the new B8 is 100 per cent Volvo, which is great for us. that it is a bigger engine but with bigger horsepower – an increase from 290hp to 330hp, meeting the needs and feedback of our customers. "We feel that, because Euro 6 will be legislated between 2019 and 2020, the new chassis gives our customers choice. "We as an industry predominantly operate in cities, and one of our biggest goals is to have quieter cities worldwide. One of the biggest benefits of Euro 6 from a bus perspective is the reduction in noise. "Another highlight is that we currently, and very successfully, have some hybrid vehicles operating that are showing impressive results. "The fuel consumption has been fantastic. In New South Wales on a private run we have been seeing fuel consumption of about 28 litres per 100km, which is a huge difference with consumption normally around the 52-55-litre mark for a city bus. "We currently also have hybrids running in other major Australian cities giving great figures." Regional service manager for NSW metro Ali Ali and regional service manager for regional NSW Isaac Williams were on hand at the Sydney unveiling to give ABC a rundown of what the new products entail. From an engineering perspective, the B8R with the Euro 5 chassis bears no changes to the previous chassis from the front half to the centre. The back half is where all the changes begin. The chassis has the newly developed Volvo D8C engine, built in-house with 330hp and 1200Nm of torque. At 330hp it has a 40hp increase in power on the top-selling B7 and this makes it either on par or above competitors, and is available with a choice of two transmissions: either the ZF or Voith automatic. There is a new exhaust system and AdBlue system, and additional changes made to meet industry requirements for engine venting. A new SCR exhaust system sits behind the left rear wheel with a heat shield separating the system from the radiator. The AdBlue system located behind the rear right wheel uses compressed air, where previously the system was run by an electric Bosch pump. It has a 50-litre tank that in the past was done via a valve pump dosage system. Currently the Euro 5 hasn’t operated in Australia but, due to the new technologies used overseas, operators are showing a 3 per cent saving in fuel usage compared to the previous 7-litre chassis, even though it has the significantly more powerful engine. Once again, the front to mid-section of the new chassis remains the same, with all updates coming to the rear half. The Euro 6 has the Volvo D8K engine and is available in three horsepower categories – 280hp, 320hp, and 350hp – with an impressive 1440Nm of torque for the 350hp engine. One of most exciting changes to the Euro 6 is that there are three transmission options, and an I Shift available in coach applications on the 350hp. 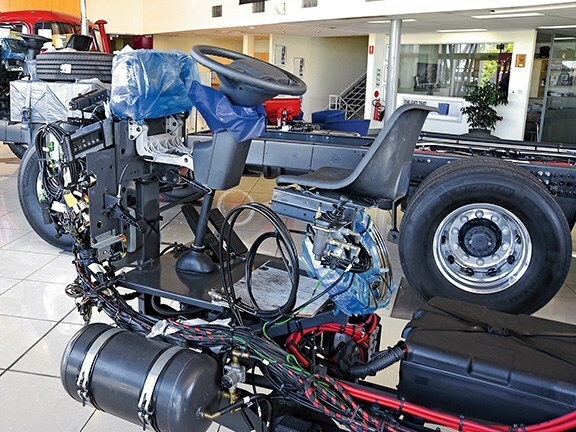 The updated power steering system uses an electric system rather than a hydraulic system, bringing the advantages of noise reduction and reduced maintenance requirements. Previously it was up to the body builder to route the power steering piping. With this new chassis, Volvo runs everything underneath the front of the chassis. The big advantage of this is the improved noise reduction, especially for the coach drivers, as traditionally the pipes ran behind the driver. The improved pipe placement also ensures easier maintenance and access, as previously piping ran from the front to the rear, and maintenance was dependent on builder placement of the piping system. Further additions include a completely new cooling, exhaust, battery and AdBlue systems. The new exhaust system for the Euro 6 has a combination of SCR catalyst, EGR recirculation and DPF filters. There are updated insulation requirements that had to be met for the Euro 6, with a greater emphasis placed on insulation and noise reduction in addition to the emissions requirements. 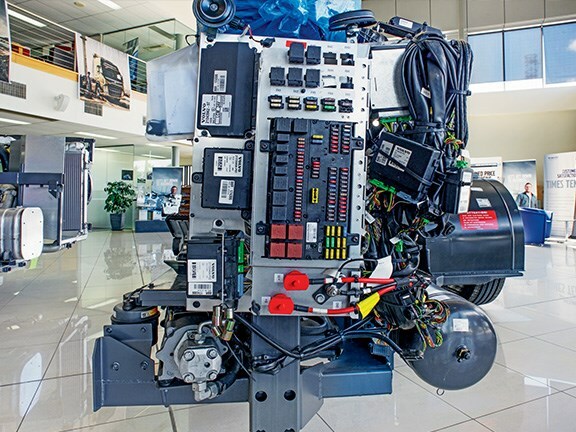 Currently more than 100 Euro 6 vehicles are already operating in different bus environments around Australia, with Volvo seeing a further 3-5 per cent fuel savings on the previous Euro 5 7-litre chassis. In the previous unveilings we were told it was unanimous that most people were interested in what they were getting and how much the upgrades would cost. The main benefits will be both the 40hp rise in power with combined reduced running costs due to fuel savings and the increase in servicing interval times. Impressively, the 8-litre Euro 5 Chassis will not cost any more than its predecessor, and the powerful 8-litre Euro 6 Chassis will only be priced approximately $12,000-14,000 more. The next step is waiting to conduct a test drive with one of the new Volvo chassis and getting a feel for the power and new technologies. The Volvo B8R and Volvo B8RLE are now available for purchase in Australia. Driver’s station: Volvo’s ergonomically designed driver’s station, easy-to-view instruments and individual steering wheel adjustment.